While the Oracle-Google trial will most likely be postponed from Halloween and might be stayed in whole or in part pending reexaminations, preparations for such a trial continue anyway. On Friday, the parties filed their lists of witnesses (including key players such as Larry Ellison, Eric Schmidt, Larry Page, Scott McNealy and James Gosling) as well as their motions in limine. A motion in limine is an 11th-hour opportunity to exclude an adversary's evidence from presentation at trial. Exclusions can also relate to arguments that are legally unacceptable and might mislead the jury. 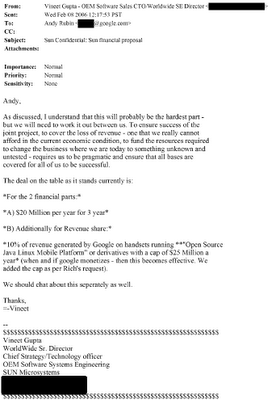 On September 22, Oracle had already stated explicitly that it "intends to strenuously pursue injunctive relief to resolve the key issue in this case: whether Google can use Oracle's intellectual property to create an incompatible clone of Java and thereby undermine Oracle's and many others' investments in 'write once, run anywhere'". That was an unequivocal confirmation of what I had been saying for a long time: damages are an important but only secondary theater of war compared to the question of an injunction -- the instrument that would give Oracle more leverage than anything else to negotiate a settlement on its terms. "Google is following in Microsoft's footsteps." Even though I put the question of damages into perspective, it's interesting hindsight to find out about what kind of business deal might have happened between Google and Sun (prior to the latter's acquisition by Oracle). Mr. VAN NEST [outside counsel for Google]: Sun proposed a royalty all in for three years of a hundred million dollars, and that was rejected by Google. . . .
[Judge Alsup]: Well, what difference does it make? Why does it matter if Google rejected it? Google may have been playing -- they may have just been trying to get it on the cheap, that doesn't mean it was reasonable to reject it. "Allowing Google to pay no more for a license than it would have paid had it not infringed would improperly put Google in a 'heads-I-win, tails-you-lose' position." "It would have been of significant strategic value for Sun to be on stage with Google announcing Android. That had value, potentially significant value. To not be on stage was not as valuable. So would the 10 million, which if I recall was year one payment from Google to Sun, would that have changed in any way our financial destiny? No. So would we have waived that for ultimately being a premier technology partner alongside Google? I believe we would have. I didn't have that option." That kind of thinking is exactly why Sun went down the tubes under Schwartz' "leadership". It's reminiscent of the revenues-don't-matter attitude of many first-generation Internet companies right before the dotcom bubble burst more than a decade ago. Of course, it can make sense for companies in select situations to forgo short-term revenue opportunities in order to generate even higher returns in the long run. But Java was the crown jewel of Sun from an intellectual property point of view at the time. It was widely adopted and popular. It was at a point at which conventional wisdom would suggest that it was way past the point at which one would still have to invest in its ubiquity. It was time for Java to serve as a cash cow. And what did Schwartz want? He wanted to be on stage. With a CEO who only cares about being "on stage", a company is strategically lost. It's also unbelievable that he treats $10 million as an amount to sneeze at. I've seen companies that have more money in the bank than the total profits Sun generated during its entire existence and still they're concerned about far smaller amounts than $10 million. Google has consistently argued that Oracle's damages calculation was baseless. In my view, the information that entered the public record suggests that it's always been aggressive (which is why I disagreed with several components of the original damages calculation), but that there's more substance to it than Google concedes. "First, Prof. Cockburn discusses standardized benchmark-test data provided by Oracle engineers who disabled the patented functionality from Android phones and measured the reduction in application start time, execution time, boot time, multitasking, battery life, and memory, among others." The filings contain various tables that show how Android performs with and without the techniques allegedly protected by various of the patents-in-suit. I won't go into detail on that material now, but should this case go to trial at some point, there will be a separate damages phase (after a liability phase) and at that point it may make sense to look at the outcome of the liability trial and its possible implications for a damages award. As the passage quoted above shows, Oracle engineers conducted those performance tests. Google obviously takes issue with that fact. The most predictable of all motions in limine was an Oracle request to exclude the USPTO's initial reactions to Google's reexamination requests -- called "first Office actions" -- from presentation at trial. I explained a while ago that such first Office actions are by definition preliminary. I have seen cases in which those were not admitted as evidence supporting the alleged invalidity of asserted patents. Some of the examiners who handle reexaminations have a 100% rejection rate at the stage of first Office actions. Yes, they declare each and every patent claim preliminarily invalid at the start of a reexamination. This way they challenge the patent holder to make the whole case for the validity of those claims. First Office actions are biased and unbalanced. While the original examination gives applicants the benefit that the companies they may sue later on won't interfere at the examination stage, making the applicant's patent attorney the only expert to influence the examiner's position, the Supreme Court's decision in Microsoft v. i4i reaffirmed that granted patents enjoy a strong presumption of validity. In my view, it shouldn't be that way because too many patent claims prove invalid or at least have to be narrowed considerably as a result of reexamination. But that's the law as it stands today, and the law is much less favorable on the reliability, and admissibility as evidence, of first Office actions. I briefly discussed Oracle's motion in limine regarding those reexaminations and Google's reply with a renowned expert on reexaminations and their use in litigation. We agreed that Oracle's argument that the jury shouldn't see those preliminary results, which Oracle describes as more prejudicial than probative, was a standard argument that one could make in any patent case. And Oracle may be right on the law, though the whole issue may be mooted (rendered irrelevant) anyway if the judge stays the patent part of the case until those reexaminations are complete. There's no doubt whatsoever about the legal validity of the final reexamination result. We also concurred that Google's lawyers have a point by saying that this case is not like all other patent cases because of Oracle's willful infringement argument. Google argues that it should not have to "sit by and watch Oracle preach its willfulness theory to the jury without a fair chance to tell its side of the story", and "to address the legally and factually distinct issue of willfulness, Google seeks to use the reexaminations as evidence that uncertainty as to the validity of the asserted patents was and is reasonable". This doesn't relate to using those first Office reexaminations as proof of invalidity, just as evidence that Google had the right to refuse to take a license from Oracle since it doubted the validity of those patents. The tricky thing here is that even if Google said that the relevance of those first Office actions is limited to the willfulness issue, the jury would hear Google's argument and might be swayed by it even as it decides the validity issue. In fact, that would likely happen. It's hard for people -- especially for laypersons -- to compartmentalize their minds to such an extent that they will rule on one fundamental issue (validity) without taking into account something that creates significant doubt in a layperson's eye in that context since it should be considred only in connection with a logically separate issue (willfulness). I'm a skeptic of the work patent examiners around the world do on software patents, but even I would be more inclined to doubt the validity of a patent claim if it has been preliminarily rejected than if I didn't know about that at all. "[Alternatively to admitting the presentation of the first Office actions, the Court] can defer the issue of willfulness to the damages phase of the trial, where it in fact belongs for a number of reasons." This alternative suggestion is further proof of a possible injunction being the most important thing in this litigation. Willfulness also affects the amount of damages (a finding of willfulness results in triple damages), but the judge recently told Google that it should think about the ramifications of a potential willfulness finding for an injunction. Fighting willfulness is a top priority for Google. If the whole willfulness issue is postponed to the second phase of the trial (the damages phase, which would then be a broadbased remedies phase), Google will probably also hope that Oracle won't be able to show the jury during the first phase of the trial any evidence as the Lindholm email -- evidence that relates to willfulness but can have a strong psychological effect on a jury's willingness to believe that Google has indeed infringed valid patents. Google has been contesting all along the notion that a possible infringement of Oracle's intellectual property rights by Android as published by Google on the web automatically means that Android devices infringe. And it seems to me that Oracle didn't want to take Google's bait and get into too much of a detailed analysis of different devices because there are too many of them and Oracle actually has strong arguments that modifications of the Android codebase by OEMs aren't outcome-determinative for the infringement question at issue in this litigation. Google's lawyers try in various ways to take advantage of Android's pseudo-open business model. They tried to use Android's (very debatable) open source nature as an argument for zero damages -- something that the judge rejected outright. And they brought a motion in limine that Oracle shouldn't even be allowed to present evidence concerning Motorola Mobility's alleged infringement. In light of Google's efforts to acquire Motorola Mobility, I believe Oracle will be particularly interested in this, but long before the acquisition was on the horizon, Oracle already tried to depose MMI engineers. In early August, Oracle went the extra mile and asked a Chicago-based federal court to compel MMI to testify. On the one hand, I fully understand that Google's lawyers make whatever argument can help their client in this litigation in terms of making it harder for Oracle to prove its case. But on the other hand I believe Google's management should rein in those lawyers when they go too far and do things that are harmful to Google's relationships with Android device makers. Even though all Android OEMs will hope that Google can defend itself successfully, the problem is that Google's constant denial of the undeniable (including the ridiculous zero damages claim I mentioned before) may ultimately force Oracle to sue some OEMs directly, and it definitely validates the strategy of all those patent holders who assert their rights against OEMs rather than against Google directly. "Having been aware of this issue since early in discovery, Oracle could (and should) have obtained the HTC and Samsung versions of Android source code via subpoena, or taken depositions of HTC and Samsung employees regarding their modifications to Android code. Oracle did neither." presenting this untimely evidence of Motorola Mobility products and activities". But Oracle claims that the MMI deposition is just evidence and doesn't amount to a whole new theory. Google wants to have its cake and eat it. I repeat that this shows to every patent holder out there that it may be more efficient to assert patents against OEMs directly rather than deal with Google's unreasonably obstructive tactics. So there has been some analysis of Android-based devices, but many new ones have been released and Oracle wasn't allowed to amend its infringement contentions accordingly. That, again, may force Oracle to go after OEMs directly. By not accusing particular devices in its litigation with Google (or by not doing so on a timely basis), Oracle hasn't waived its right to pursue infringing OEMs. One of Oracle's motions in limine proposes to "exclude evidence or argument regarding Oracle's past actions with APIs". APIs are application programming interfaces, and Google claimed those are generally not copyrightable but failed with its related summary judgment motion, which means that it's now up to the jury to decide. Google makes various arguments about how Oracle and Sun made use of other companies' APIs, such as by using names for mathematical functions that were previously found in other software such as Visicalc or implementing portions of APIs from Linux as part of the Solaris operating system. Google also says that Oracle implemented portions of APIs from IBM (apparently, Google's allegations are limited to what Oracle describes as "a handful of names"). Oracle argues that Googl shouldn't be allowed to claim that Oracle is an "unworthy plaintiff" since Oracle itself "is not being sued for infringement" in this case. Oracle says that any evidence related to Oracle's use of other APIs in other contexts is "not specific to the Java-related inventions and copyrighted works at issue in this case, and it is irrelevant to the issue of whether they are copyrightable in any event". "Consideration of Oracle’s alleged use of portions of third party APIs would require a mini trial to determine the circumstances surrounding the alleged use of the APIs and to place that use in its proper context. In addition to analyzing the 37 packages of Java APIs that Google copied, the jury would have to go through a similar analysis for completely unrelated products that have nothing whatsoever to do with this case. The jury would have to consider what portions of APIs, if any, Oracle used; whether they were copyrightable; if they were copyrightable, whether Oracle had permission to use them; and how they compare to Google's copying of the Java APIs." I think that Oracle is right on this one. Anything related to other APIs than Java would be a digression and a distraction. APIs at issue in this case." "For more than a decade, Sun was a leader in promoting open systems and architectures and interoperability. Both directly and through the American Committee of Interoperable Systems ('ACIS')--the leading advocacy group for interoperability that Sun formed, ran and housed in its corporate headquarters in Mountain View--unambiguously articulated the position in public statements, sponsored academic publications, numerous amici filings in software infringement cases, and testimony before Congress that APIs such as the ones at issue in this case are not entitled to copyright protection. Rather, Sun’s position was always that copyright protection extends to underlying code, but not to non-literal, functional elements such as APIs. In reliance on more than a decade of widely publicized statements by Sun and ACIS, Google and the Open Handset Alliance created Android, a new and original platform, to be interoperable with Java language APIs. Consistent with its public stance, Sun applauded Google’s efforts [...]"
In my view, even the argument that Google acted "[i]n reliance" on those statements isn't sufficient to make those issues relevant to the case at hand. If this were a normative, political debate over whether APIs should be copyrightable, then a hypocrisy-based "open double standards" argument would be perfectly appropriate. But there must be a limit to this kind of argument in infringement lawsuits. Otherwise, for example, companies could infringe Red Hat's patents on the basis that Red Hat has made and supported some public statements against the patentability of software. We will soon know the judge's decisions on these motions, unless the judge previously orders a stay, in which case the admissibility of first Office actions would become a non-issue (since the case would then continue on the basis of final Office actions) and some or all other decisions on motions in limine might be postponed.